a few supplies from my junk stash. 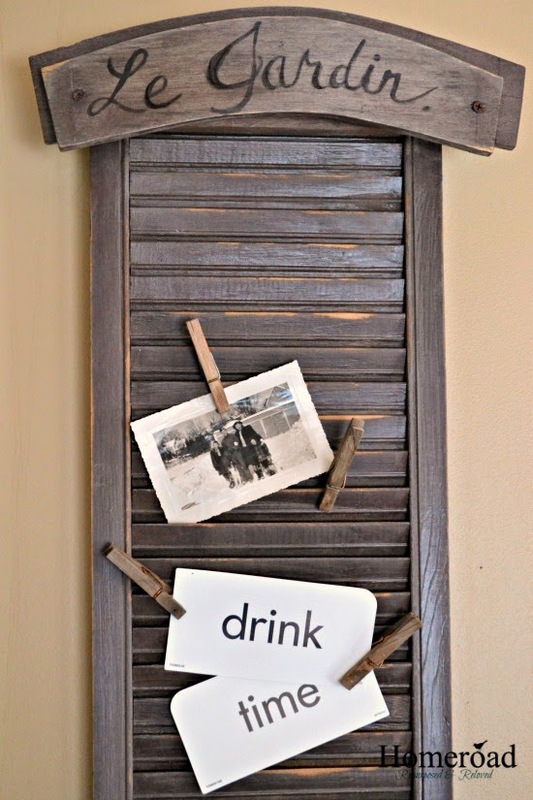 This shutter will hold memos, cards, or pictures to keep life organized in the kitchen, office, or entryway. I painted the shutter with Miss Mustard Seed Milk paint in Curio and attached an old arched French garden sign to the top to resemble a roof. 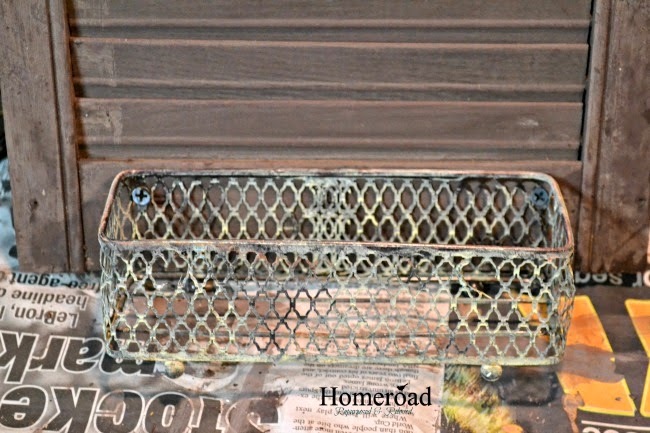 A copper basket with a beautiful patina is attached at the bottom of the shutter. and darken the chalky milk paint color. When the sealer dried I heavily sanded the piece to remove some of the shine and to distress the slats. 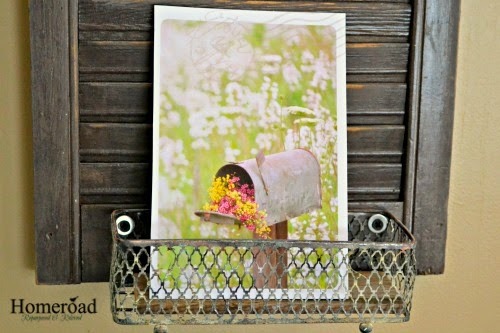 I added DIY aged clothespins to the shutter slats to hold cards and memos . I made with the matching shutter. I love the color you painted it and it looks so wonderful with your garden sign as a roof, too cool! Love shutter projects- although if I have any more in my house I will look like a shutter project shop! 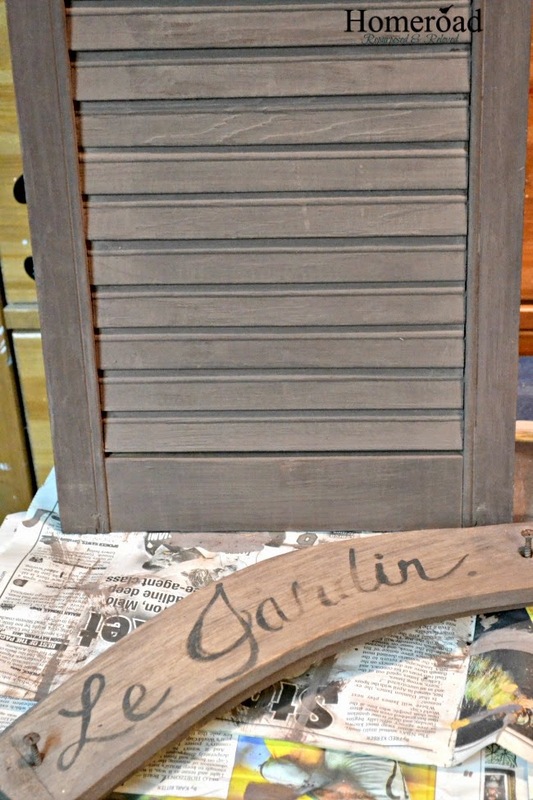 The Le jardin sign is the perfect finishing touch! I love this! I have some old wood shutters that I found at an estate sale. I turned one into a photo display, and now I found a use for another. This would look so much better in our Texas room to keep business cards and notes on instead of the fabric covered bulletin board. Thanks for sharing! Pinning to my shutter board.